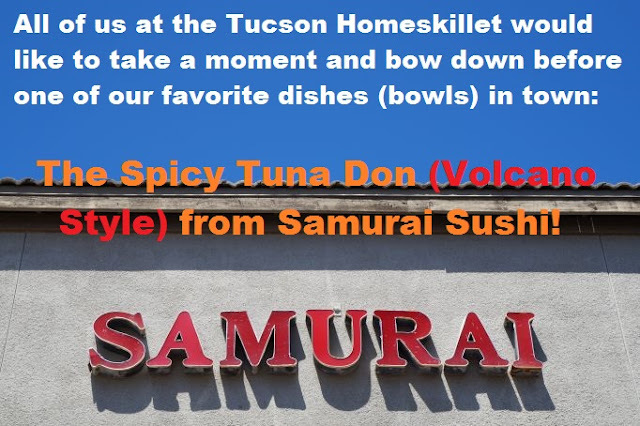 The Tucson Homeskillet: Volcano Tuna Don At Samurai Sushi....You Our Only Friend! Volcano Tuna Don At Samurai Sushi....You Our Only Friend! 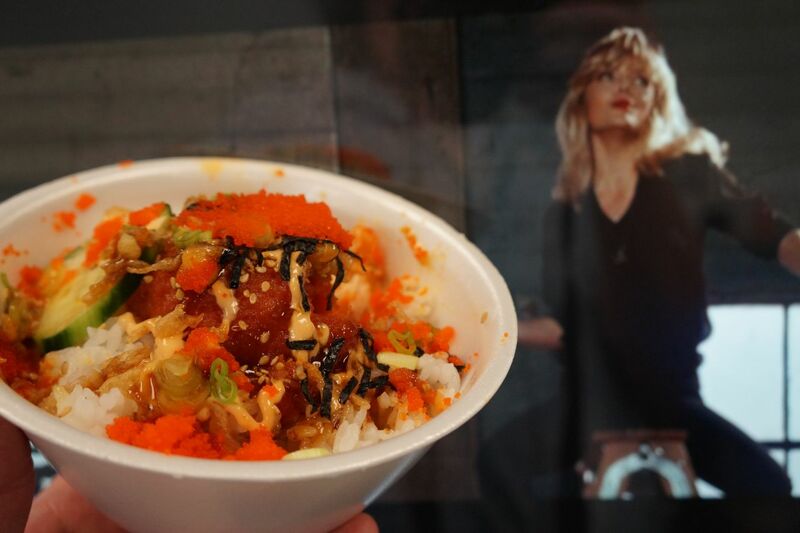 Gaze upon the glory of the Spicy Tuna Don (Volcano Style)! "Have you been to Samurai? 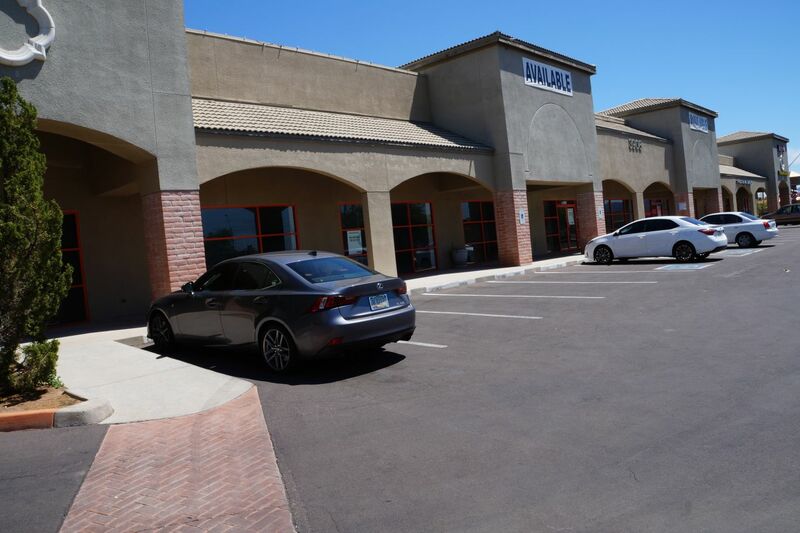 That place on Oracle? Man, so good." We hadn't in fact. Not yet anyway. To be honest we were a bit nervous about going there (yeah, this coming from a crew that seeks out restaurants in gas stations, back alley eateries and the fish fry in dive bars) because the place is receded in a near abandoned strip mall and it just looked wonky. Well anyway, one day, as fate would have it, we were hungry (duh!) 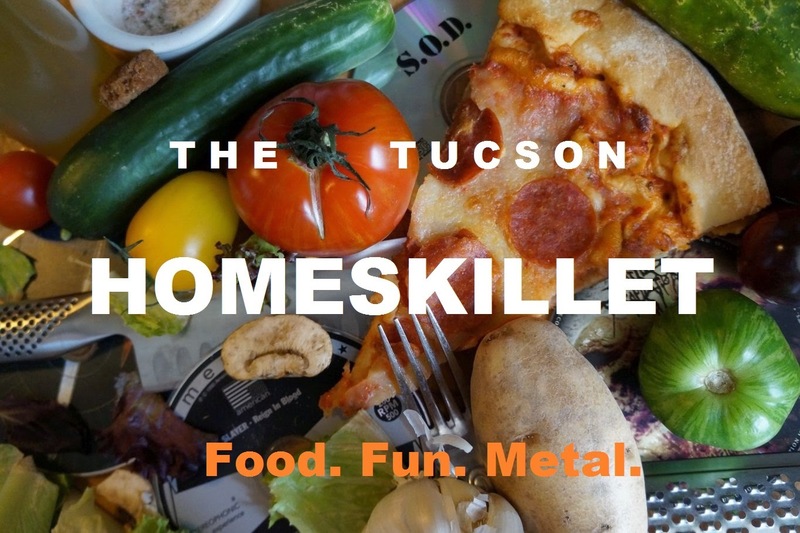 and up for a new food adventure. "Hey. You wanna try that Japanese place on Oracle? What's it called...?" "Yeah. That one. C'mon, let's go. Should be fun." We looked up some reviews online and, wouldn't you know, it was all 4-5 stars across the digital board. Alright, we're in. Let's do this. 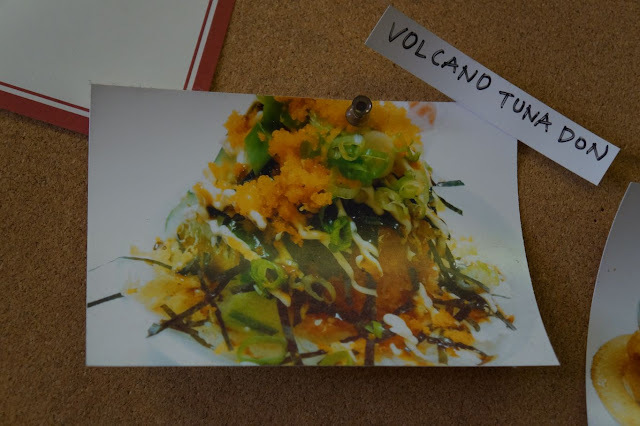 "They have this dish," they said after asking us if we had been to the restaurant, "called the Volcano Tuna Don. It's a pile of spicy tuna on rice with, like, spicy mayo and cucumbers and fish eggs and, dude, all sorts of crazy stuff. You gotta try it." So we looked at each other and said: "Let's try it!" And we then kicked each other for not trying Samurai earlier. 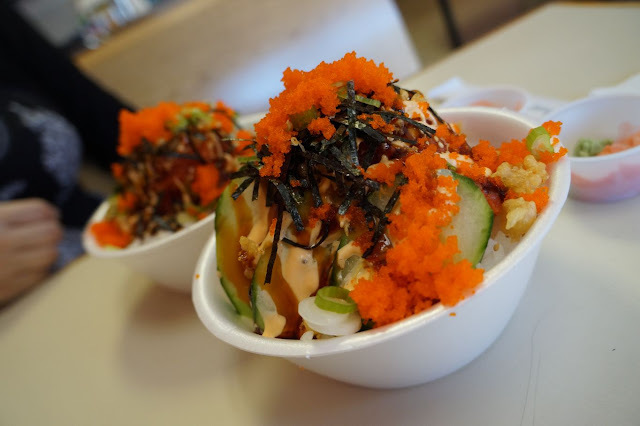 The Spicy Tuna Don (Volcano Style) was, and is, amazing. Look for it. Do you see it? Samurai itself is very nondescript. A few tables scatter the cramped floor and you order at the counter because the place labels itself as "fast food". 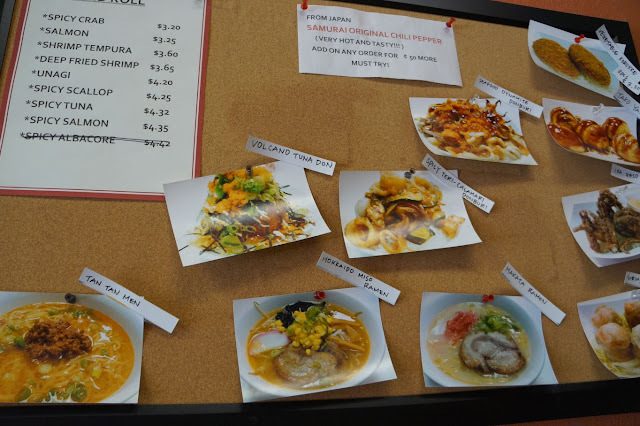 It's more fast casual because the food at Samurai is, oh, a few if not many rungs above what is normally deemed 'fast food'. Everything we have had at Samurai is fresh and delicious and, yes, served up very fast. This is the perfect spot for a quick lunch if you are short on time but want real delicious food. The Spicy Tuna Don (Volcano Style) though is in a category all its own. For some bizarre reason all of the elements in the dish, well...bowl, harmonize in a near perfect character. The Spicy Tuna Don (Volcano Style) is a bowl of perfectly cooked sushi rice which is then topped with a mound of spicy sushi grade tuna. Oh, they could have stopped there but...no. The tuna is then surrounded by cucumbers and topped with tempura flakes. As if that wasn't enough, the entire pile is finished with a spicy mayo, a fair drizzle of Unagi/eel sauce, diced scallions, seaweed strips and eventually completed with a good dose of Masago (fish roe...you know, eggs). Pure wonderousness served up in a bowl and all for about $10. 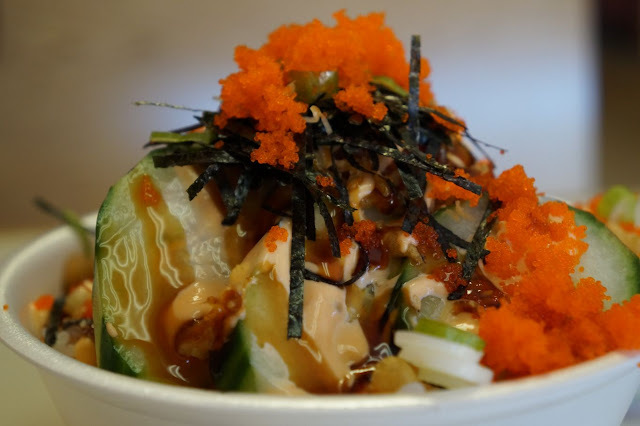 We often dream about the Spicy Tuna Don (Volcano Style) and sometimes, when we do get around to eating it again, we are so happy to be doing so that we want to celebrate its existence. 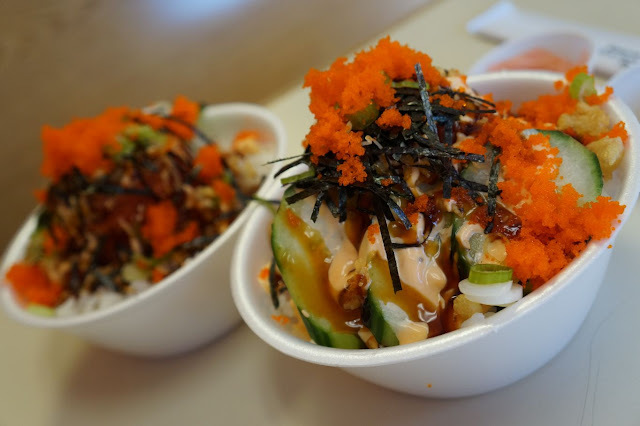 In fact one hot summer day when we got the chance to gorge on a bowl of the majesty that is the Spicy Tuna Don (Volcano Style) we were so thrilled to be in its presence again that we took it out on a fun romp around town. Because we love you Spicy Tuna Don (Volcano Style) from Samurai! 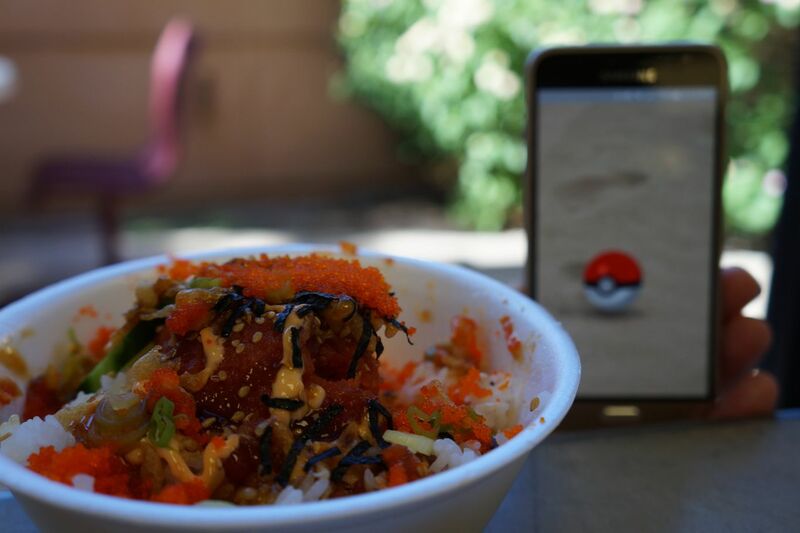 First we took Spicy Tuna Don (Volcano Style) to the park where we played Pokemon GO! You got a Squirtle! Good job pile of fish and sauce served over rice! Then we watched "Grease 2" because as we always say: They only made the first "Grease" so they could make the far superior sequel. Spicy Tuna Don (Volcano Style)'s favorite song is "Cool Rider". 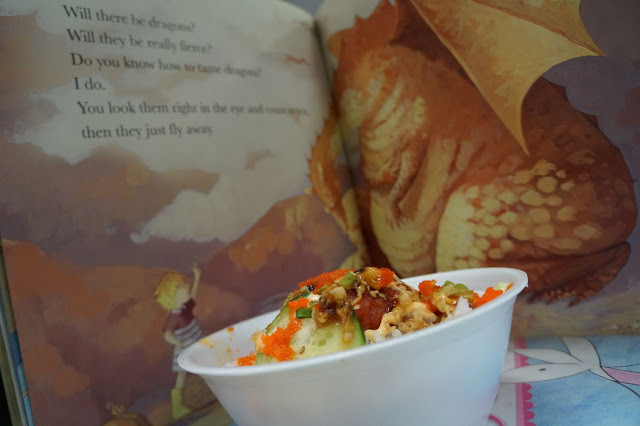 You go bowl of tasty Asian inspired bits! Afterwards we headed over to our local library just in time to participate in storytime. 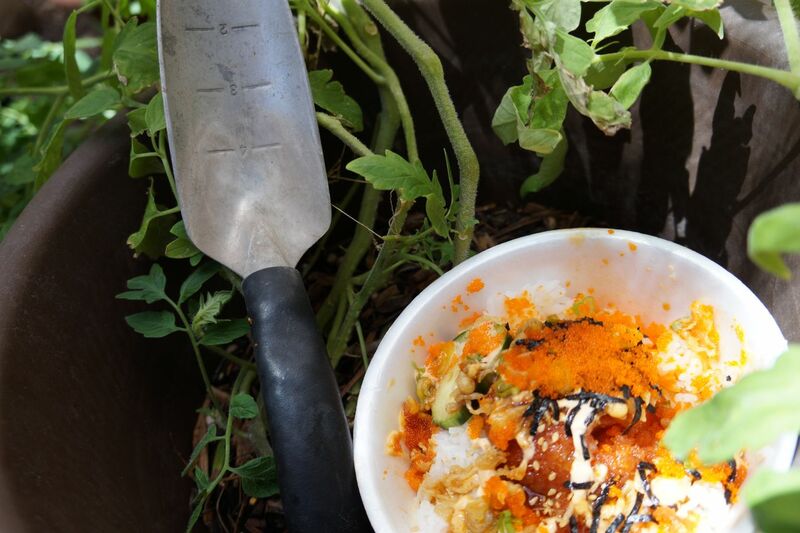 We then made our way to a community garden where Spicy Tuna Don (Volcano Style) harvested some heirloom tomatoes. "But there aren't any tomatoes on me," said Spicy Tuna Don (Volcano Style). We know scrumptious food dish...we know. Later we cranked up some classic rock and jammed on some heavy guitar riffage. 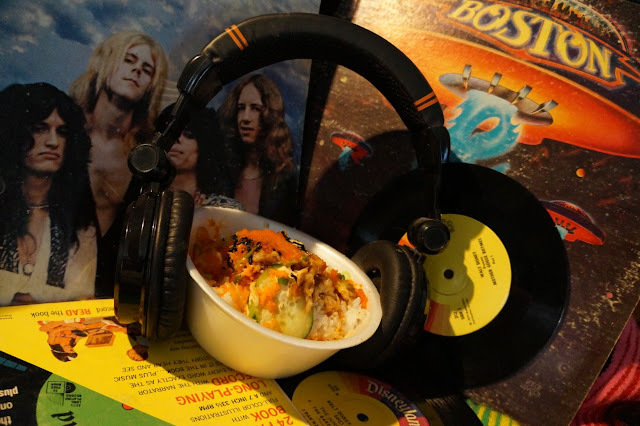 Spicy Tuna Don (Volcano Style) enjoyed Boston but didn't like Aerosmith so much...that made us love it even more! 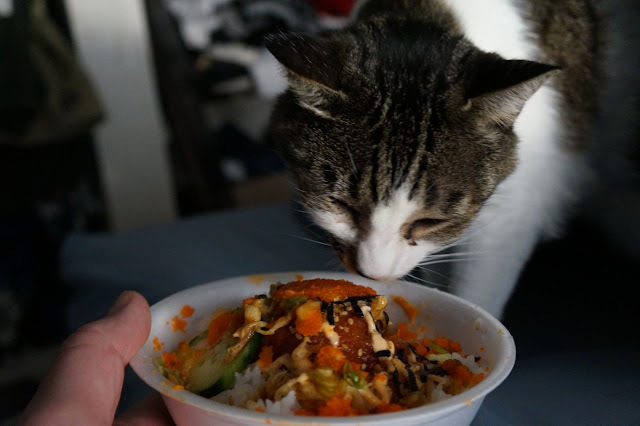 Finally Spicy Tuna Don (Volcano Style) was introduced to Lil Poundcake, our resident cat and food critic. You can have some Lil Poundcake, just a little...no! She ate the whole thing! C'mon Lil Poundcake. Well, if she liked it, you know its good. Thank you Samurai Sushi for creating such a delicious dish. And thank you Spicy Tuna Don (Volcano Style) for just being you. We will definitely be back for more and next time we'll take you on a waterslide!